These are the same boxes that you receive your 10.36 x 77 and 9.5 x 77 brass in when you order from Peterson Cartridge. 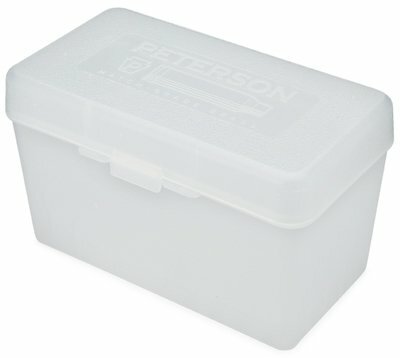 The Peterson Cartridge X-Large Ammo Box is perfect for your 10.36 x 77 (.408 CheyTac®) and 9.5 x 77 (.375 CheyTac®) ammo. The box is made from a heavy plastic which is weatherproof and practically indestructible. It has fifty individual compartments to keep your casings protected and can hold a loaded whole round up to 4.43 inches tall.